This weekend, OMD launched our grassroots pilot program in North Carolina to deepen our engagement and impact to make plant-based food accessible for all. 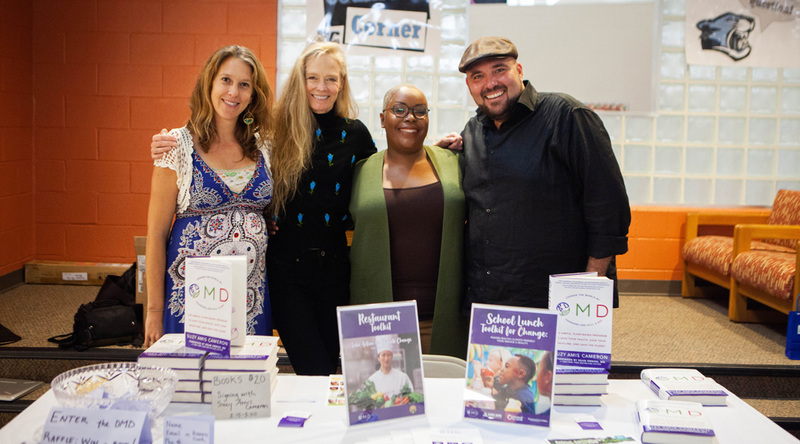 Led by our incredible North Carolina OMD organizer, Zakiyaa, we’re working with community leaders to get more healthy, plant-based food served in K-12 schools and restaurants. The pilot will also feature a blog series to shine a spotlight on local leaders working to resist factory farms; promote food justice; provide access to healthy, plant-based foods; support better environmental stewardship; and improve community health from the ground up. We featured some of these leaders, along with health expert Dr. Neal Barnard of the Physicians Committee for Responsible Medicine, and our founder, Suzy Amis Cameron, who talked about plant-based eating as a way to improve community health and fight climate change, at the first ever Triangle Health Fest. 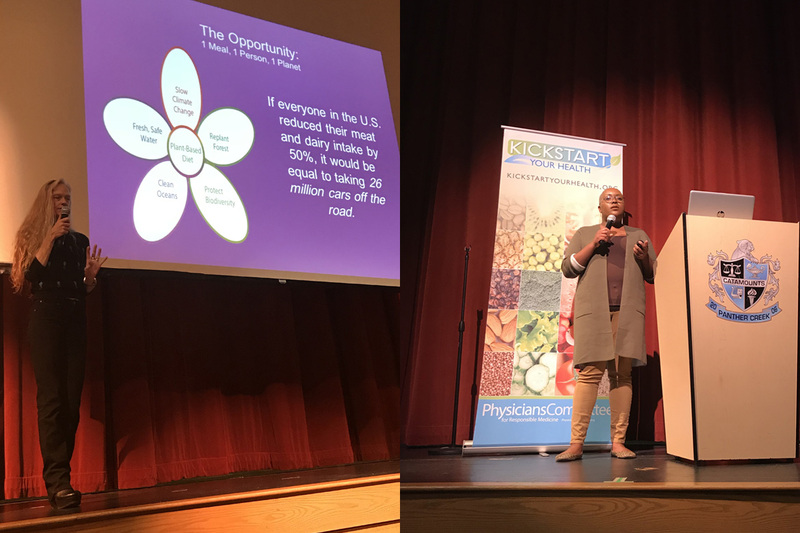 This inspiring community event, organized by PCRM in partnership with OMD, brought together hundreds of diverse community members and offered resources on how to live a plant-based lifestyle. We especially enjoyed connecting with Nadine Blake, Food Service Director at Central Park School in Durham, whose commitment to serving plant-based options to kids was truly inspiring. Zakiyaa also spoke on the importance of increasing healthy, climate-friendly options in restaurants and K-12 schools throughout the region, and invited the community to join the OMD movement. Why North Carolina? The state is ground zero for environmental injustice and a hotbed of health inequity. North Carolina has the largest number of factory farms (also known as concentrated animal feeding operations, or CAFOs) in the country, and Durham County has more hogs than people. People living near these operations often suffer from chronic illness and are subjected to substandard living, as the noxious stench from the “lagoons” of excrement are inescapable — even when indoors. 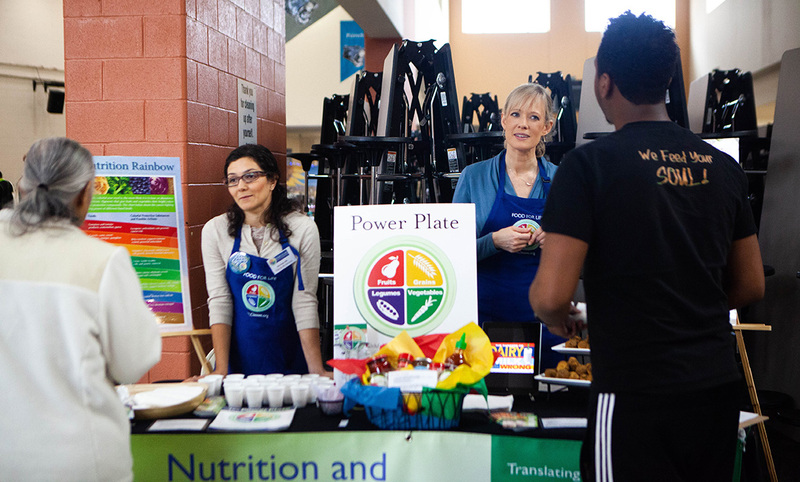 The mayors of Cary, Durham, and Raleigh, N.C., all endorsed this event as “Kickstart Your Health Day,” to highlight the importance of healthy eating in the community. 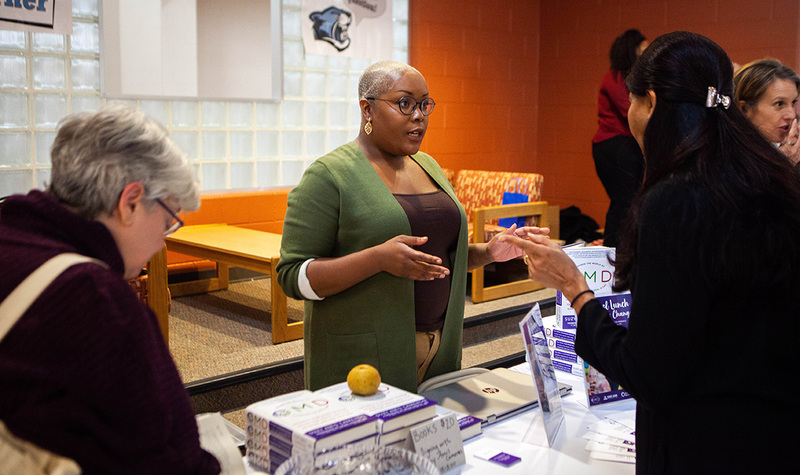 Events included a Zumba class and plant-based cooking demo, along with screenings of Forks Over Knives and What the Health, which was followed by a Q&A with Dr. Neal Barnard. Dozens of exhibitors turned out to educate the public including OMD, the PCRM, Farmer Food Share and the Triangle Vegetarian Society. Local businesses including Souly Vegan, Lean Wellness and Queen Wa Cafe joined the celebration as well. This event helped us build bridges with parents, doctors, young people, and community leaders, all passionate about working with OMD to increase access to plant-based foods throughout the state. We’re fired up over here at OMD, and we’re ready to partner with the community to create change! Looking to get involved in your community? Learn more about how you can take action to change restaurant menus and get more plant-based foods in K-12 schools.